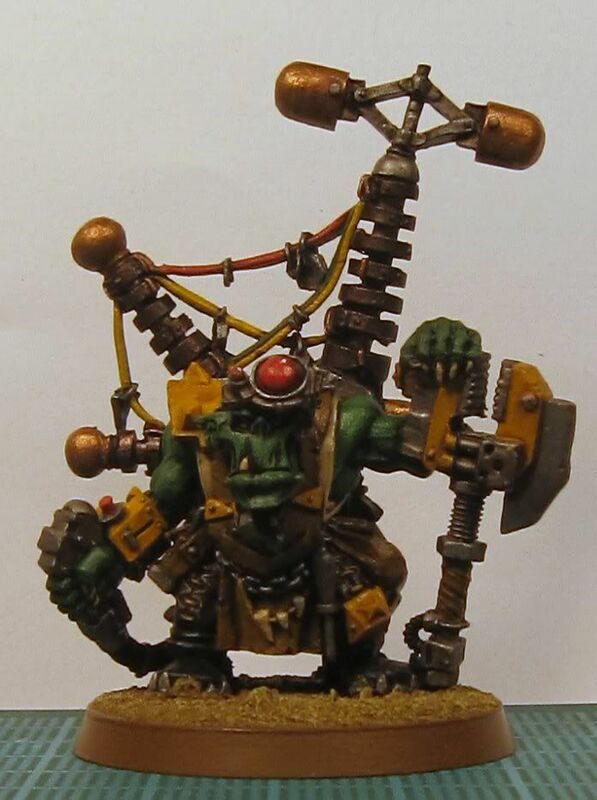 I have complete my Big Mek with Kustom Force Field and his three grot assistants (aka grot oilers). 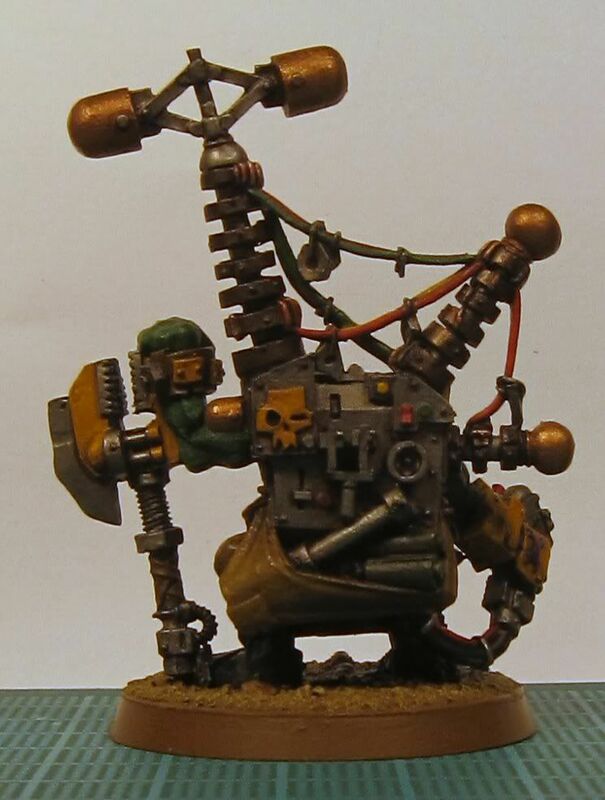 I had a lot of fun painting the Big Mek. I painted his lens using the technique for painting jewels. I like the way it turned out. His KFF was also fun to paint. Here are some close ups. The Nob with Waaagh Banner was also fun to paint. As far as the Nob's banner, I am not sure why it needs to be powered, but it is a nice touch. Up to a total of 690 pts worth of Orks painted for the year. Next month, Deffkoptas! Imperial Armour 8 will soon be available for pre-order. I cannot wait to get this book! Also, FW is going to be releasing Stompa upgrade kits. 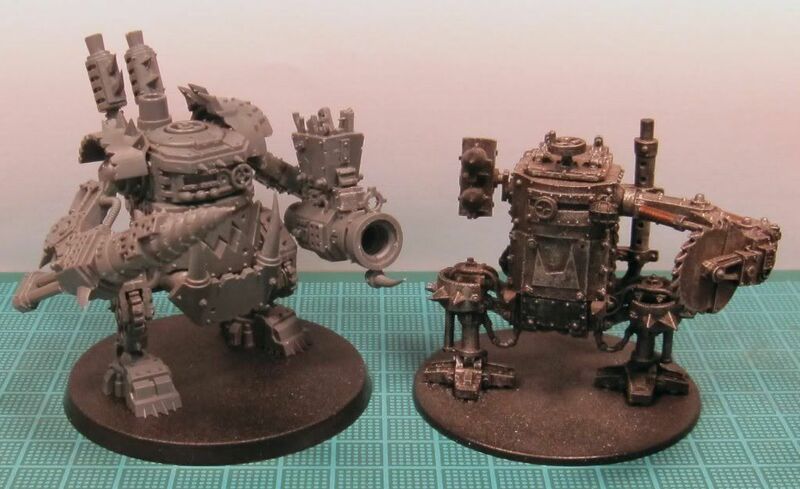 That is a sweet looking Big Mek Stompa! I wanted to thank everyone who voted in my poll for 'Which Ork Fast Attack unit to paint?' this past week. The Deffkoptas won by more than a 2:1 majority over the Warbikerz and Stormboyz combined. I was quite surprised by that. I have a total of six AoBR deffkoptas and one of the original metal ones. Even though I only need to paint one unit of five, I am going for getting all seven done. 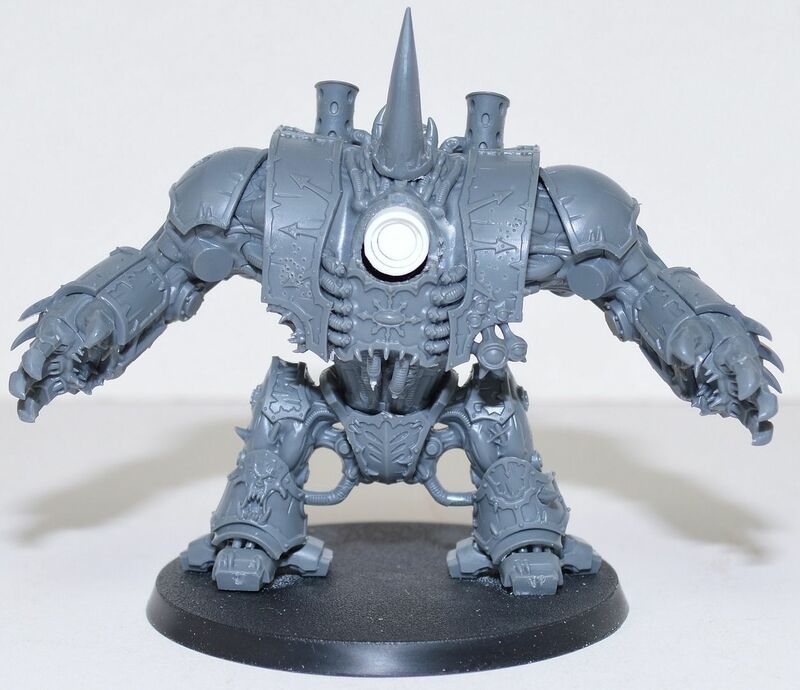 I have a couple ideas for conversions using the extra buzzsaws leftover from the new Deff Dread and Killa Kans kits. More to come in April! Last night was the fifth and final game of the SEMBBL and my opponent was another Undead team. My opponent's team was valued 190,000 gp more than mine, and I bought an extra re-roll and Budweiser Babes with my inducements. The game did not go very well for me. The Kick Off result for the first half was Riot, so we both immediately lost a turn right of the bat. I won the coin toss but elected to kick off in the first half. On my opponent's opening turn, I lost two Black Orc blockers (both KO'd) and a Blitzer (smashed hand). Losing three players before getting to do anything really threw me off my game and I was not able to recover. My opponent had a player on the edge of the end zone and could have scored on turn 6, but elected to keep beating my team down and put off scoring until turn 8. Fortunately he did not do any long term damage. The Budweiser Babes came in handy for getting my players back. The second half I did slightly better, but not good enough. Again the Kick Off result was Riot and another lost turn for both teams. I was still flustered from the first half and made some bad choices, allowing my Thrower carrying the ball to get blitzed and fumble the ball. Again my opponent could have scored again about half way through the second half but this time he decided to try to get as many star points as he could before scoring, but it did cost him a couple short turns. He did manage to get the ball to the players he wanted to and scored late in the game. My troll was voted MVP even though he failed five Really Stupid rolls (four of those needed a 2+ and I rolled 1's). Overall, an embarrassing performance for the Orcs. My team's final record for the season is 1/3/1 and no hope of a playoff spot. Better luck next season. For the past couple of months I have had the urge to play some WHF, but I have had a hard time deciding on an army to play. At first, I wanted to play Chaos Dwarves using the Indy GT Dwarfs of Chaos Army Book, but after reading through the book, I am somewhat turned off by it. Do not get me wrong, I think the book is very well done and there are a lot of new and interesting ideas in it. It is just that there are a few little things that bother me. Also, it is not an army list I would be able to use in the League I am thinking of joining. I am not sure why it is so hard to choose, but it is. Thoughts? Last Thursday was game 4 of the SEMBBL and this week it was orcs vs orcs. With orcs playing orcs, it was a real brawl, especially since on the second half kick off result was Get the Ref. Our teams were similar, the only real difference was he had a goblin and I had more Black Orc Blockers and Blitzers. This was the first game I played were my opponent's team was valued less than mine and he had enough inducements to buy an extra re-roll. I won the kick off and elected to kick. There was no scoring in the first half as both teams just beat on each other and kept turning the ball over. In the second half, both teams were still beating on each other and there was a lot of fouling going on since the ref was not going to call anything. I managed to score on turn four of the second half. My opponent came very close to tying the game on his turn eight. He had a player pick up a fumble in his half and hand it off to his goblin. The goblin what accurately thrown by the troll just 8 spaces from the end zone. All the goblin had to do was push it two time to score. He made the first Push roll, but failed the second one into the end zone and he was out of re-rolls. So close. It was a great game and my first victory. My team is 1/2/1. Which Ork Fast Attack unit to paint? The unit choice for the month of April in the 2010 Painting Resolution Contest is Fast Attack. As much as I love the Ork Fast Attack units, I do not use them all that often. I am sure it is just me, but I do not have much luck with them. Anyway, I have the following FA units I can paint. Since I cannot decide which unit to paint, I thought I would ask the readers of the War Room. You can vote in the Poll in the far right column. Also, feel free to leave a comment for why you chose that unit if you do not mind. Thanks for your participation! I have finished nine of my Nobz. 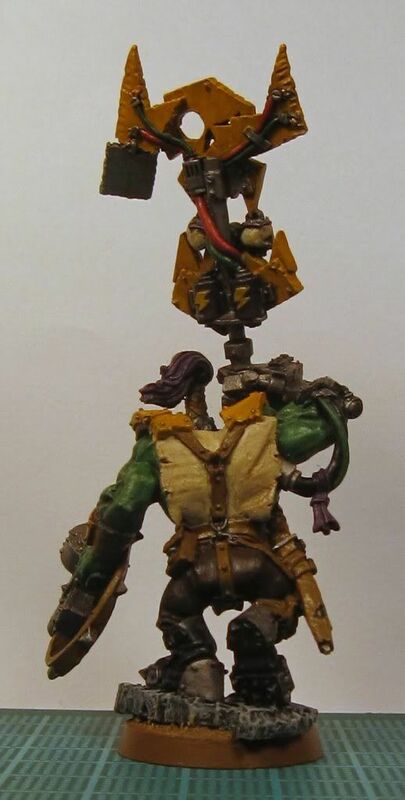 I was putting the final touches on my Painboy when I accidentally knocked him off my workbench, rolled over him with my chair, and then stepped on him as I fell out of my chair in my attempt to not roll over him. He is most likely beyond repair, so I think I will need to get another one. Just got an email from Games-Workshop regarding a new Warhammer 40,000 Expansion. I have not heard anything about this, but it sounds intriguing. Gather your tanks and ready your lascannons – in June the pages of White Dwarf magazine and games-workshop.com join forces to bring you a whole new expansion for Warhammer 40,000: Spearhead. Spearhead is a new way to play Warhammer 40,000 that enables you to unleash exciting tank battles and daring breakthrough missions on the table top, bringing the full mechanised fury of the 41st Millennium to bear in your games. June's White Dwarf will contain the main part of the supplement, including new rules, missions and plenty of inspirational hobby advice. Alongside this, games-workshop.com will feature additional material for registered members such as details for how to assemble your Spearhead formations along with even more painting, modelling and collecting tips. As if a whole new Expansion wasn't exciting enough, it's going to be accompanied by a range of new miniatures including some stunning new plastic kits – more details of these kits, and the Spearhead Expansion, will follow in May's issue of White Dwarf and on games-workshop.com in due time. I am curious what new models there could be. 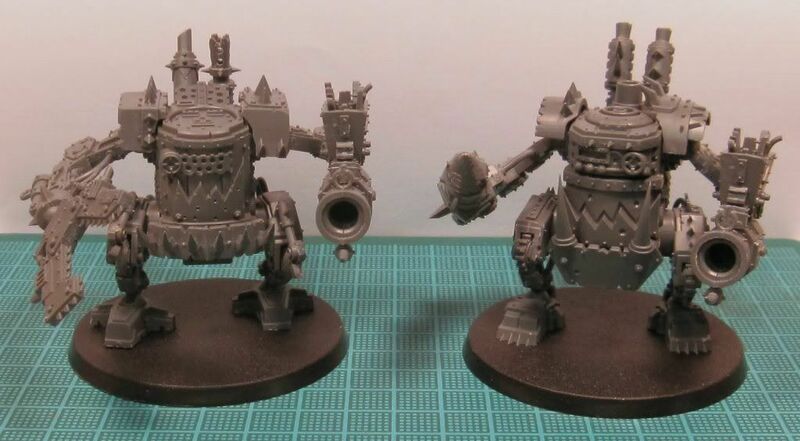 Do I dare hope for new Ork Warbuggy/Wartrakk kits? I know, not very tank-like, but one can still hope? Here is a WIP picture of my first Bad Moon Nobz. I still have a little detail work to do on them and I need to paint their bases. I really like the way they turned out so far. 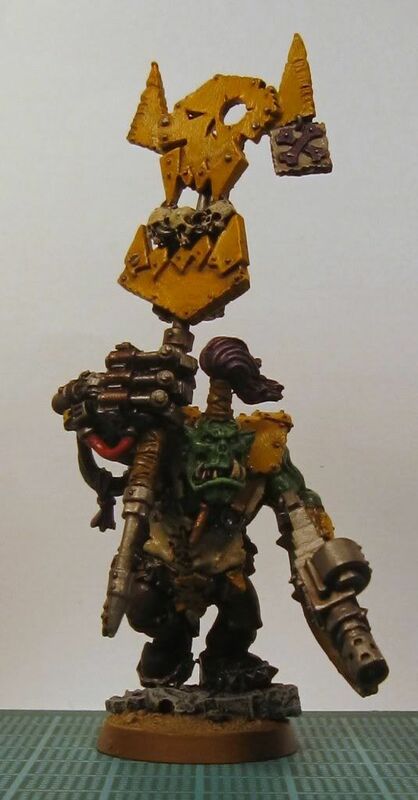 The two nobz with 'uge choppas are made straight from the Nob boxed set and the two with power klaws are converted from AoBR Nobz and the klaws from the Nob boxes set. Last night was my week 3 game of the SEMBBL. My opponent's team was undead. In the Pre-Match setup, I had enough money in Inducements to hire a mercenary troll for the match. I am glad I did. Facing down two mummies made me think I was going to need that extra strength. I won the Coin toss and elected to kick off. The roll on the Kick Off table was 'Brilliant Coaching' and I won that roll off, giving me an extra Re-Roll for the half. Not much else happened in the first half. It was just a game of keep away and neither team could hold onto the ball long enough to do anything. However, I did lose a Blitzer and a Lineman to injuries in the first half. Fortunately both results were only Badly Injured, so no long term effects other than being out for the game. I also had a Black Orc Blocker and a second Blitzer KO'd. Things started off bad at the start of the second half. I failed both recovery rolls for the KO'd players and had to start with eight players on the field. The second half Kick Off roll was again 'Brilliant Coaching' which I won as well. Things were going about the same as in the first half until, on Turn 4, one of my Throwers tried passing the ball to the other Thrower who dropped the pass. The Undead team was able to recover the ball and score, while also injuring another Blitzer (Badly Hurt) and KO'd one of my throwers. On the subsequent Kick Off (also a Brilliant Coaching result that I again won), I had to start with only seven players. On three KO'd rolls, I only made one for the thrower. Unfortunately, the opponent's team had a full eleven players and things were looking grim. I was unable to hold the line of scrimmage and ended up losing the ball in the backfield and the Undead team was able to capitalize on it. On the following kick off, which this time resulted in a Blitz, things looked dire. That was on turn seven, and my first block roll of that turn failed, as did the re-roll, and ended my turn. Fortunately, my opponent also failed his first block roll of the turn and it was down to turn 8. On turn 8, my thrower was able to pick of the ball, hand it off to the other thrower, who ran down the field and successfully passed it to a Black Orc Blocker, who actually caught it and took off down the field. Unfortunately, he just did not have the movement to get to the end zone, but it was my best play of the game. With the gold I gained from the match, I am able to permanently hire a troll. My Fan Factor dropped on a roll of snake-eyes. According to this article on Games Workshop's website, Imperial Armour 8: Raid on Kastorel-novem is due to be released in the next couple of months. "...The book focuses on the Elysian Drop Troops and Raven Guard Space Marines as they try to re-take an Ork-infested world. Volume 8 will be the first Imperial Armour book to focus on the Orks and features rules and background for all of the current Forge World Ork miniatures as well as some brand-new ones." With all the new Ork models being release from Forge World lately, I had heard rumors of this book but this is the first official news I have seen of it. I have been eagerly awaiting it and will probably order it as soon as it becomes available. I hope it is good. As with most Ork players, I have been eagerly awaiting getting my hands on the new Killa Kan kit. Fortunately, I was able to get two boxes at my LGS today and I have already put together two Kans with Grotzookas. I like these kits. They look a lot better than the old Kans (not that there was really anything wrong with the old kans). The new ones are larger and bulkier, and have a lot more detail. Here is a comparison of the two. With these new Kans, I will have a total of nine Kans. All I need to do now is convert a Deff Dread with a KFF and I will be able to field an impressive APOC Dread Mob. Earlier this week, I converted another Black Orc Blocker using the plastic WHF Black Orcs. This one I modeled with his fists over his head as if he is getting ready to smash an opponent. I think he is my favorite. 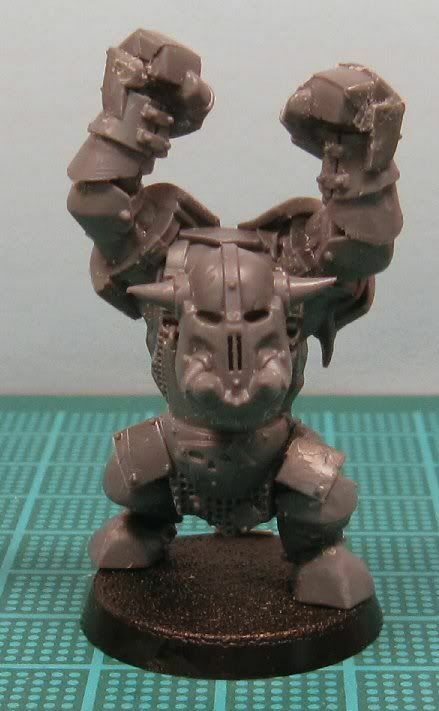 I also tried converting an Orc Blitzer using WHF Orc bits, but I am undecided if I like him or not. 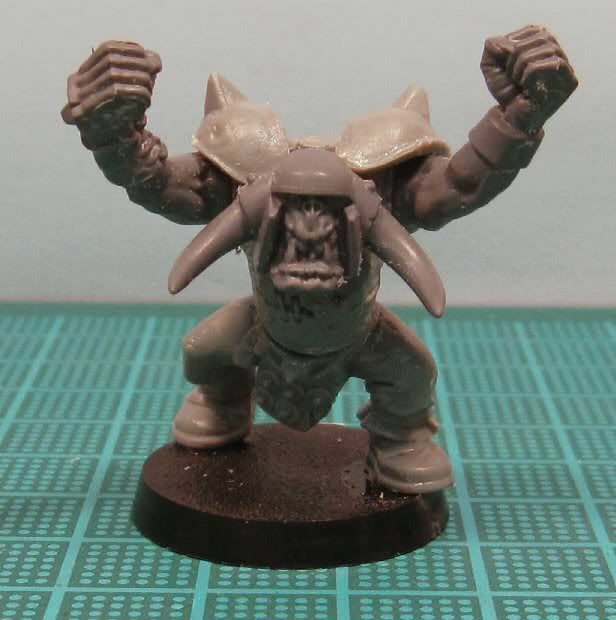 He does not look very Blood Bowl-ish and I am not sure what to do to make him more that way. Any ideas? This week's opponent for the SEMBBL Winter Brawl was High Elves and although the game resulted in a Draw, it was a blast. When I had played Blood Bowl previous to this league, it was with players who were all learning the game and we we more or less goofing around with the game. So now I am finding out how inexperienced I am by playing against a group of veterans. Fortunately, they are a good group and both of my opponents so far have been kind enough to give me some pointers during the game. This game went better than my last game. The dice were not out to get me. There was no scoring at all in the first half as neither team was able to hold onto the ball for any length of time. The HE returned the second half kick off for a touchdown. I tied the game on my last turn of the game (which was the last turn for either team) by having Zogzag, my orc thrower, throw a completion to Gaszar, a blitzer, who ran it in for the TD at the buzzer. My team caused 3 casualties to the HE team and my team leads the league in Casualties with 6 total. Wazzag, a blitzer, killed one of the High Elf Lineman. Gordag, a lineman, smashed the collar bone of another HE lineman and Karrog, also a lineman, injured a third HE lineman forcing the elf to miss his next game. Karrog won the MVP even though he was killed during the game by a HE Catcher. Next week, my opponent is an Undead team and I am really looking forward to it.